Le Bon David (as he was to his French fans and friends), David Hume (to the rest of us) was one of the most loved philosophers of his time (although Rousseau may disagree). And many is the contemporary philosopher that professes attachment to his work. There is something exhilarating and remarkably fresh about his muscular empiricism and naturalism, his commitment to common sense, and his scepticism of all things metaphysical. His outlook and temperament is almost quintessentially that of the modern, naturalist philosopher. And when it comes to contemporary naturalism most of what is said has its origins in Hume. I first encountered Hume through his work on religion. The Dialogues Concerning Natural Religion was a formative book for me. As the title suggests, it is a philosophical dialogue very much in the Platonic mould. It recounts the after-dinner conversation and debate among three protagonists: Cleanthes, Philo and Demea. Cleanthes is a proud defender of natural theology (the belief that argument and evidence points to God); Philo is a religious sceptic (often thought to be a mouthpiece for Hume’s own views); and Demea is something of fideist, believing that God’s existence is already known to all and that philosophy can, at best, tell us something about His nature. Demea says relatively little throughout the dialogue; Cleanthes and Philo dominate the discussion. At the centre of their debate rests the design argument. In this post (and the next) I want to share their analysis of that argument. Many philosophers have been impressed by the way in which Hume — through Philo — dismantles the logic of the design argument. Some go so far as to suggest he dealt the argument a killer blow — though this must surely be contested. JCA Gaskin is one of those who is impressed by Hume’s treatment of the design argument. His book Hume’s Philosophy of Religion provides a comprehensive exposition of Hume’s reasoning. 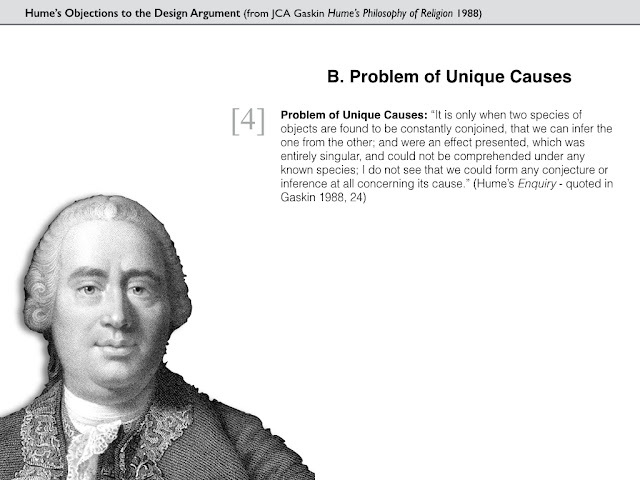 Gaskin claims that Hume deals with two distinct versions of the design argument in the Dialogues and that he levels ten objections to these two versions of the argument. I want to go through all ten of these objections in what follows. Look around the world: Contemplate the whole and every part of it: You will find it to be nothing but one great machine, subdivided into an infinite number of lesser machines, which again admit of subdivisions, to a degree beyond what human senses and faculties can trace and explain. All these various machines, and even their most minute parts, are adjusted to each other with an accuracy, which ravishes into admiration all men, who have ever contemplated them. The curious adapting of means to ends throughout all nature, resembles exactly, though it much exceeds, the productions of human contrivance; of human design, thought, wisdom and intelligence. Since therefore the effects resemble each other, we are led to infer, by all the rules of analogy, that the causes also resemble; and that the Author of nature is somewhat similar to the mind of man, though possessed of much larger faculties, proportioned to the grandeur of the work, which he has executed. By this argument…we prove at once the existence of a Deity. P1. Case A: Some observed effect (X) in the world around us. P2. Case A is like Case B (which involves some observed effect Y) in all important respects. P3. In Case B, P is the cause of Y.
C1. Therefore, in Case A, P* (similar to but slightly different from P) is likely to be the cause of X. (1) We observe order/regularity in the natural world. (2) The natural world and the artificial man-made world are similar in all important respects. (3) In the artificial world, wherever there is order and regularity it is because there is some designer/architect that is responsible for that order/regularity. (4) Therefore, there is likely to be some designer/architect of the order/regularity in nature. (1*) We observe purpose/adaptation of means to ends in the natural world. (2*) The natural world and the artificial man-made world are similar in all important respects. (3*) In the artificial world, wherever there is purpose/adaptation it is because some designer/architect is responsible for that purpose/adaptation. (4*) Therefore, there is likely to be some designer/architect of the purpose/adaptation in nature. Many discussions of Hume have tended to fixate on the teleological version of the argument. One reason for this is that Darwinian evolutionary theory got going in the century after Hume and provided a good naturalistic explanation for the adaptation of means to ends that impresses Cleanthes in the Dialogues. Thus we tend to find that argument much less persuasive nowadays. But Gaskin argues that the nomological argument is the version of the argument with the deeper pedigree. Furthermore, one could argue that the nomological argument has undergone a renaissance in the past half century in the guise of the argument from fine-tuning (though there are definitely discrepancies between the two argument and nothing said in this series of posts should be taken to have much bearing on that more recent version of the argument from design). So the distinction is of some historical philosophical significance. It is also of more practical philosophical interest. Some of the criticisms Hume levels against the design argument really only find their mark if we have one version in mind. That said, it is still worth treating them as a pair and that is what we shall do for the remainder of this series. Whenever a criticism is raised that is limited in its reach to one version of the argument rather than the other, this will be made clear to the reader. A. Restrictions on the Conclusion: These are objections that highlight the weakness of the conclusion of the argument. B. Problem of Unique Causes: This is an objection (there is only one of these) that is based on Hume’s famous theory of causation, roughly the idea is that it is difficult to make inferences about the causes of unique effects; the universe is a unique effect; hence it is difficult to make inferences about its cause. C. Analogical Weaknesses: These are objections that highlight weaknesses in the analogy underlying both forms of the argument. D. Problems in Explaining Order/Purpose: These are objections that block the argument by either offering alternative explanations of the order/purpose we see in the universe or by highlighting problems with the explanation of order. 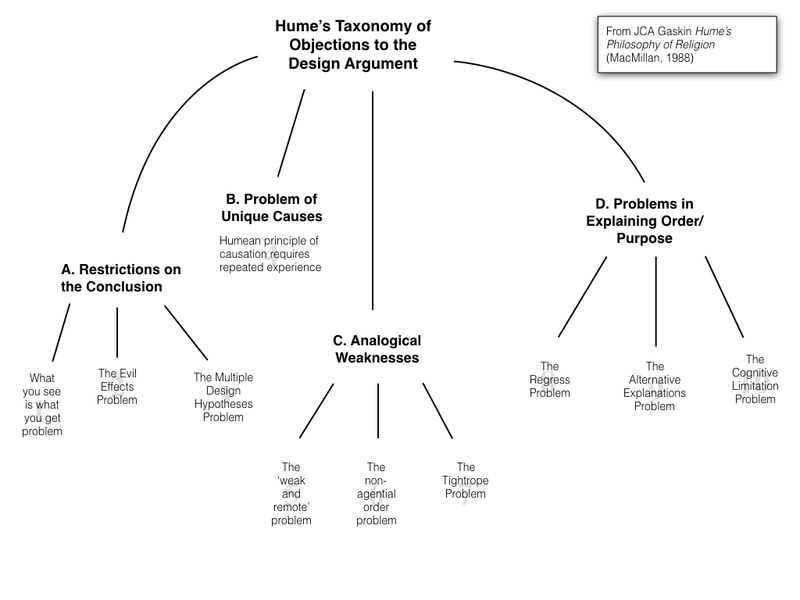 The full taxonomy of objections, with the ten specific forms, is illustrated below. This may not mean too much to you right now, but we will go through each branch in what follows. I’ll do the first two branches in the remainder of this post and the other two in the next post. The centrepiece of the design argument, in both the teleological and nomological forms, is the analogy between the natural and artificial worlds. 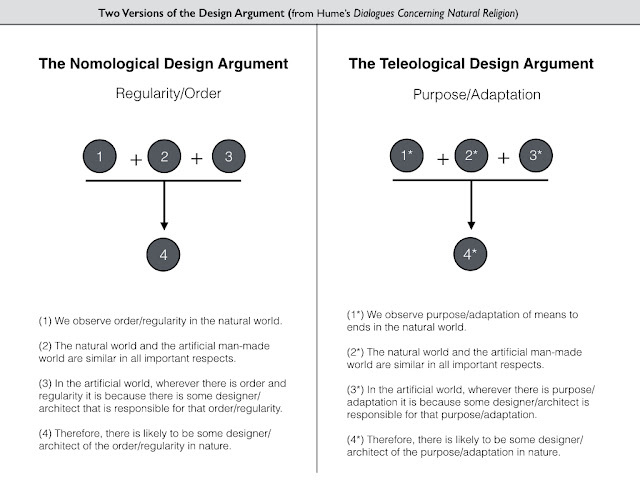 The claim is that because we know that the order/purpose we see in the artificial world is the result of human agency and design we can infer, by analogy, that the order/purpose we see in the natural world is the result of divine agency and design. The first set of objections leveled by Philo in the dialogues takes issue with this inference to divine agency. In essence, he argues that the analogical argument cannot get the theist all the way to God. There are three specific forms of this objection. I will give each of the objections a name and number. I do so both to facilitate recall. 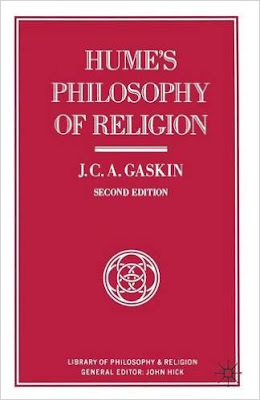 When Gaskin introduces these objections he also tends to include some original quotation from Hume’s writings to back it up. I will follow suit here whenever possible, but note that not all of the text comes from the Dialogues. Although the Dialogues contains pretty much all the objections, it does not always express these objections in the most efficient philosophical form. This is a result of the dialogic form of writing, which lends itself to aesthetic flourishes that occasionally distract from the main line of reasoning. In other words, when you are inferring from an effect to a cause, you are only entitled to infer a cause with the properties that are necessary to explain what you see in the effect, nothing more. When I find a letter in my postbox, I am entitled to infer that someone delivered it. I am not entitled to infer that the person who delivered it had red hair, was in a bad mood, and suffered from gout — at least, not unless additional evidence, that would entitle me to make those inferences, can be found. I can only make those inferences that are supported by what I see. The same goes for inferences from the order and purpose we see in the world around us. From those effects we might be entitled to infer some sort of designer, but we are not entitled to infer what theists typically infer, which is a supreme being with maximal virtues, who cares profoundly about human well-being, has a plan for our salvation, and will reward us with everlasting life if we are lucky/do the right things. Inferring those additional properties brings us outside the realm of the analogy. Richard Swinburne has lodged a complaint against this line of reasoning. He argues that if we accepted Hume’s WYSIWYG principle, then scientific inquiry and explanation could never get off the ground. Scientific explanation always involves explaining one thing in terms of something else (something more fundamental and with different properties). For example, the scientific explanation of what it means to be alive doesn’t appeal to some cause with ‘life-giving’ properties. Instead, it appeals to metabolic chemical processes within cells and DNA replication and transmission. These biochemical entities and activities seem to have properties that, taken individually, are very different those we associate with being alive and yet, when organised in the right way, they manage to exemplify the property of being alive. In essence, Swinburne critiques Hume for adopting an explanatory principle for which medieval scholastics were ridiculed. Gaskin defends Hume by suggesting that Hume would agree with Swinburne on the preferred form of scientific explanation. But Hume would counter that we are only entitled to explain one thing in terms of something very different when we have independent epistemic access to that other thing. Thus, we are entitled to explain what it means to be alive in terms of biochemical processes because we are able to probe, interrogate and experiment with those processes independently of observing their effects in living beings. It’s not like we observe a chicken scratching its way around a farmyard and then magically infer the underlying biochemical processes from these behavioural effects. Instead, we slice and dice the living tissues of the chicken, view them under a microscope, manipulate their component parts through experimentation, and slowly build up an understanding of the underlying biochemistry. The Deity is known to us only by his productions and is a single being in the universe, not comprehended under any species or genus, from whose experienced attributes or qualities we can, by analogy, infer any attribute or quality in him. In essence, the problem for the theist is that they are presuming to know more about God than the design argument can actually establish. By the logic of the design argument alone, you cannot infer a designer with all of the properties typically ascribed to God. (2) The Evil Effects Problem: “The true conclusion [of the design argument] is, that the original source of all things is entirely indifferent…and has no more regard to good above ill than to heat above cold.” (Hume’s Dialogues). The idea here is that the effects we observe in the world contain both good and evil. Because they contain this mix of properties, we are not entitled to infer from them a designer that is all good. At most, we are entitled to infer a designer that is morally indifferent. This objection is closely allied to the problem of evil, but is not quite the same thing. It is not presented here as a general reason for disbelieving in God but rather as a reason to doubt that the design argument gets us to God. In this manner, the argument Philo is defending in the Dialogues is very similar to the so-called ‘Evil God’ argument that has been defended by Stephen Law (among others). The essence of Law’s argument is that all the observable evidence in the universe points just as much in favour of an Evil God as it does of a Good God. (3) Multiple Design Hypotheses Problem: If valid, the design argument could establish a number of design hypotheses, such as: (a) the universe is the product of a committee of designers; (b) the universe is a discarded experiment of an old or second rate deity; or (c) the universe has been designed to run on its own devices and the creator plays no further part in its unfolding. The theist wants the argument to point to a traditional monotheistic God: a single, all-powerful creator of the universe, who is still interested in his creation and has a salvific plan for it. 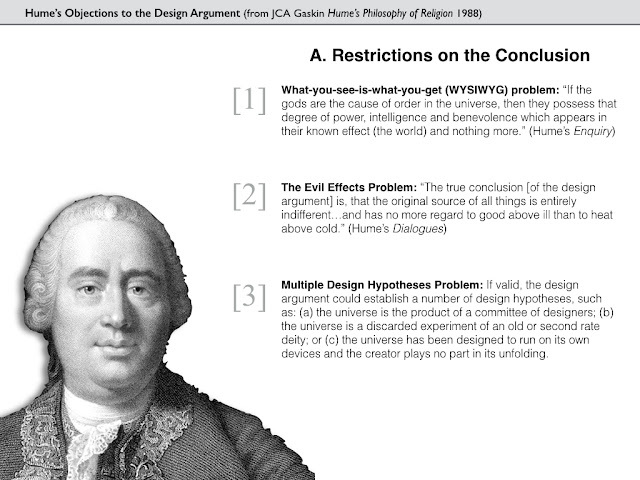 Hume, however, says that the design argument cannot give you that God. The principle of analogy underlying it provides just as much support for multiple Gods, discarded experiments and deistic gods. In human experience, we know that designed objects, particularly when they are complex, are often the products of teams of designers, not single individuals. We also know from human experience that some designed objects are just experiments, occasionally discarded and often bug-ridden. Finally, we know from human experience that it is possible for machines to be created and left to operate until their eventual destruction without further interference from their original creators. So analogies between the artificial and the natural do not point straightforwardly to one God. Swinburne and others have challenged this by suggesting that other explanatory desiderata point to a monotheistic God. Ockham’s razor, for example, tells us that when you are trying to explain some phenomenon you should posit the simplest explanation possible. To Swinburne, Hume’s claims about the possibility of a committee of Gods involves positing a more complex explanation where a simpler one will do. Furthermore, Swinburne submits that the unity of nature (the fact that everything in the universe seems to fit under a shared set of scientific laws) points to a unity of creation (that it is all the product of one supreme mind). Gaskin defends Hume from this counterargument by highlighting the fact that Hume was well aware of the need to posit simple explanations. But this desideratum is not supreme and its application can be limited by other factors. Hume’s point was that human experience suggests that complex designed phenomena are usually the product of committees and teams, not individual effort. The weight of experiential evidence — the very evidence we use to support the original analogy — thus favours the committee hypothesis. And, what’s more, the evidence for unity in nature might be overstated. It might be true that all parts of nature are consistent with some underlying set of physical laws, but this does not mean that all parts of nature can be explained in terms of those laws. Try as we might, we cannot explain all of biology in terms of physics, or all of psychology in terms of biochemistry, or all of economics in terms of psychology. There appear to be distinct explanatory principles ruling across multiple emergent domains of human interest. This is what we might expect from a committee of designers, each of whom takes responsibility for a different part of the total creation. Hume’s view of causation is roughly this: you can only say that events of type A cause events of type B if you repeatedly observe events of type A being conjoined to events of type B. Cold weather can be said to cause frost and ice only because we repeatedly observe the conjunction of the cold with frost and ice in space and time. If we observe an event of type A being conjoined to an event of type B on just one occasion, then we are not entitled to infer any causal relationship. Hume does not believe that causality is something that can be readily and easily inferred. He was sceptical of philosophers who thought you could observe necessary causal relationships between events. This creates a problem for the theist because they are trying to make an inference about the cause of a singular event or state of affairs, namely: the existence of the universe. By definition, there is just one universe and hence only one observation we can make about its occurrence. This is not enough to make a causal inference about its origins. The challenge to the Humean view is that there are examples of seemingly unique events for which we readily (and convincingly) make causal inferences. Swinburne argues that much of modern cosmology is like this, as are certain aspects of anthropology and archaeology. We find a single object in a dig site and infer a human designer; we observe a cosmological event (e.g. the cosmic microwave background radiation) and infer a single cause (the Big Bang). Why can’t we do the same for the universe as a whole? The problem with this response is that the examples used are not that convincing. We do not simply infer unique causes from unique events in cosmological or archaeological settings. In the archaeological case, we use our understanding of how humans work, the objects they like to make, the design principles they use, and use all of this background knowledge to make a causal inference. In the cosmological case, we use our understanding of how matter works in the present era to make inferences about how it was likely to behave in the past. Also, we do, in fact, now have experiments running that try to recreate the conditions in the early universe, allowing us to check our scientific theories against repeated observations of reality. In all these cases, we are making causal inferences about events that are internal to the universe and we can use our background knowledge of how the universe works to guide our causal inferences. The situation is very different when we make inferences about the universe as a whole and posit some external cause. In that case, our background knowledge of the universe is of no assistance. Or is it? Gaskin’s discussion of this objection is odd because it ends with a concession. Gaskin notes that the whole point of the argument from analogy is to suggest that the universe as a whole belongs to a class of objects (machines) about which we do have considerable background knowledge, and which background knowledge can be used to guide causal inferences about the creation of the universe. Thus, the analogical argument seems to sidestep this whole Humean line of reasoning. Of course, Hume has a response to this. He thinks it only manages to sidestep the objection if the analogy underlying the argument is sufficiently strong. That’s something that his next batch of objections calls into question. We’ll cover those objections in part two.